Being a high-capacity media, video drains enterprise bandwidth faster than any other digital media used by businesses today. Network administrators deploying video in any organization are privy to all video delivery challenges and how video use can be extremely taxing on the enterprise network. However, growing business video needs necessitate that enterprises determine effective solutions for smooth video delivery within the available bandwidth restraints. VIDIZMO, a Gartner-recognized enterprise video content management system, offers businesses a comprehensive solution to all enterprise video streaming, storage, management, and distribution challenges in a consolidated video platform. For efficient video delivery on all user devices and in all bandwidth conditions, VIDIZMO employs a variety of WAN (wide area network) acceleration techniques and other overarching technologies that optimize enterprise bandwidth and ensure smooth and reliable video delivery for live and on-demand video content over the internet or across the enterprise network or intranet. In a dynamic, highly responsive and enterprise-grade video platform, VIDIZMO provides a complete solution with the following technologies that optimize streaming video delivery in all different deployment scenarios in the cloud, on-premises or hybrid model. VIDIZMO provides a range of WAN acceleration techniques to enable smooth video streaming while also optimizing bandwidth consumption and significantly reducing the amount of traffic needed to traverse over the WAN connections. For live and on-demand video content, VIDIZMO is CDN-enabled in that it utilizes content delivery networks (CDNs) to accelerate video delivery and performance while also managing any surges in internet traffic. Depending on user locations, CDNs have a distributed set of edge servers that optimize video delivery to users in remote offices/ branches or edge-of-network locations anywhere around the globe. The closer the CDN edge server is to the end-user geographically, the faster the content will be delivered to the user. That way, CDNs quite literally move content to the ‘edge’ of the internet, i.e., in closest proximity to the users, resulting in reduced load on the origin server, distributed network traffic, minimal WAN bandwidth consumption, reduced latency and buffering, as well as faster video startup time. In case of on-demand videos, for instance, a CDN caches the video when it is first requested by a user as it stores the video’s replicas on multiple servers around the ‘edge’ of the internet. After that, when the video is requested by others users in the same network, the requests are served by a nearby edge server rather than a remote origin server. The CDN does this by redirecting the user request from the origin server to a server in the CDN that is closest to the end user that delivers the cached video content. Alternatively, on-demand videos can also be pre-positioned to the edge servers during off-peak hours, thereby reducing network workload in prime work hours. To distribute live or on-demand streaming video over the internet across the world, VIDIZMO uses Microsoft Azure, Verizon & Akamai CDN – one of the world’s most extensive content distribution networks with point of presence (PoP) around the globe – all of which serves to enhance global content delivery with high scalability and reliability. For organizations that are already partnered with a CDN provider, VIDIZMO provides seamless interoperability with all major CDN providers offering third-party network optimization technologies, including Riverbed, Blue Coat, Cisco WAAS, as well as peer-assisted or P2P CDNs, in addition to providing its own eCDN Server Software. An integrated VIDIZMO and Riverbed solution, for instance, enables users to view and share videos by reducing the impact of video bandwidth consumption over the WAN using Riverbed SteelHead™ technologies, resulting in stellar live and on-demand video experience to all employees. The VIDIZMO platform includes enterprise video content delivery capability using VIDIZMO’s streaming server, which integrates directly into Riverbed SteelHead virtual services platform to locally deliver corporate video content to users in multiple transmission formats. It does this by using WAN optimization techniques such as content caching, data compression, latency reduction, Quality of Service (QoS), and packet coalescing. Leveraging such powerful WAN optimization solutions in combination with VIDIZMO can dramatically reduce video bandwidth utilization by as much as 98%. (Source: Riverbed). Similar results are also achieved using VIDIZMO’s eCDN Server Software and edge-caching appliances. While a public CDN addresses challenges associated with video delivery over the internet across the world, enterprise networks may still face network and bandwidth challenges that hamper video experiences in-house or across a company’s intranet. Such problems arise mainly because of small incoming internet bandwidth pipes installed on-premises or in the case of live broadcast sessions, which involve a large number of people viewing a video concurrently in the same location. VIDIZMO provides multiple solutions to enterprises faced with such challenges. One of the solutions include installing VIDIZMO’s software-defined enterprise content delivery network (eCDN) and edge-caching appliances in each bandwidth-congested location to replicate one incoming stream into thousands of streams within a local area network (LAN). As a result, viewers receive video content from a VIDIZMO eCDN edge-caching server in proximity to their location – all while incurring reduced bandwidth costs and efficient load distribution. Another solution to bandwidth-constrained networks during a live video streaming session is the use of multicast for video delivery. Multicast is a network technology that creates incredible efficiencies in video delivery by delivering live video across corporate networks using a fraction of the bandwidth required by traditional unicast transmission. It does so by converting a unicast live stream into multicast streams that are distributed to several recipients simultaneously, thereby enormously conserving bandwidth that would have otherwise been used to serve each user individually with multiple streams. The end result is a single stream per branch or office location that can be split locally to many viewers, without the need for additional hardware for content distribution and significantly reduced bandwidth utilization. Multicast, therefore, establishes a one-to-many relationship between a Windows Media Serve or Flash Media Server 4 and a multicast-enabled player over an organization’s multicast-enabled LAN or WAN network. In a fully multicast-enabled network infrastructure, video is scalably and securely delivered to a group of destination computers throughout a large, heterogeneous network where the audience size is no longer restricted by the scale of a central server or bandwidth availability. 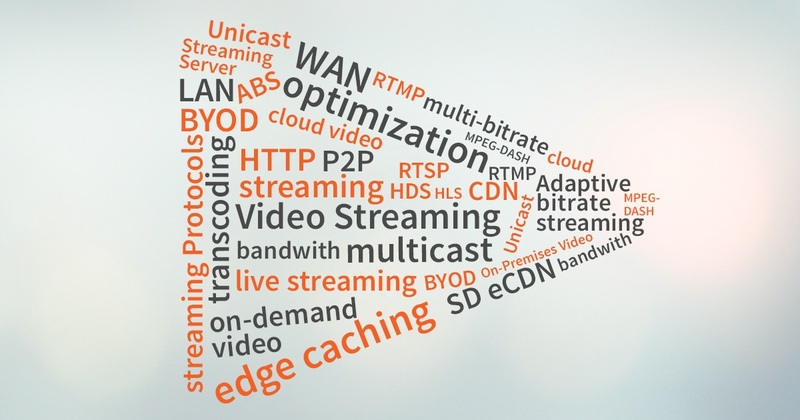 Multicasting also works over wireless networks and new feature advancements such as forward error correction (FEC) and bandwidth smoothing which allows advanced multicast solutions to deliver high-quality viewer experiences, even over Wi-Fi connections. Multicast option requires a multicast player such as Windows Media or Flash Player to view content on the device since modern browsers do not support multicast. A software agent installed at each playback device can convert multicast stream into unicast, and to playback a unicast stream in an HTML5 player. However, this adds to the complexity of the streaming solution, requiring enterprise IT to deploy agents on every device. Moreover, with Microsoft having dropped support for Windows Media Server Windows 2013 onwards, the last server to support WMS is Windows 2008 R2 editions, to which also Microsoft will officially end support starting January 14, 2020. VIDIZMO employs peer-to-peer video delivery, which allows video sharing among end users (peers) without going through a central server. Peer are computer systems connected to each other via the internet, allowing supremely efficient and reliable video delivery at scale with all peer transmission being unicast. Due to its distributed nature, P2P also increases robustness in case of failures as it replicates the content over multiple peers. Over recent years, P2P streaming technologies have gained prominence in content delivery due to its open and free nature for worldwide content distribution. Without infrastructure limitations for transmission over wide area networks and advancements in P2P networks from semi-centralized systems to decentralized ones, P2P streaming has developed a competitive edge over multicast streaming for large-scale content distribution. However, compared to multicasting, P2P is a heavyweight solution, which incurs high implementation and maintenance costs for large centralized servers that enable file sharing. Moreover, P2P delivery is not as bandwidth efficient or secure over wireless networks due to the heavy chatter between peers, which increases wireless traffic. However, the next generation of decentralized P2P networks do not require central servers, but the content searching process can take more time compared to the centralized approach. Additionally, P2P is prone to malicious malware, spyware and privacy violation due to its open infrastructure and data recovery can be challenging as every peer/ computer has its own backup system, and there’s a possibly of wasted storage due to duplication of resources and multiple copies of the same file. Adaptive bitrate streaming is a technology designed to deliver the highest possible video quality ‘adapted’ or adjusted to various user devices and network conditions. The process involves videos (delivered using modern protocols discussed below) encoded at multiple bitrates or quality levels created for all screen sizes (or user devices). During playback, the user’s bandwidth availability and network quality determine which quality level provides the optimal playback experience. Any changes in network quality or the internet connection are accommodated by corresponding adjustments to the video bitrate or quality. With such dynamic adjustments to video quality, ABS also minimizes any instances of buffering while providing high-quality playback. With VIDIZMO, all videos are encoded into five or more different bitrates and four formats with a total of up to 20 renditions. Typically, a 1080p uploaded video is encoded into 1080p, 720p, 480p, 360p, 240p bitrates to ensure playback on all devices, browsers in all bandwidth conditions. During playback, VIDIZMO’s player dynamically adjusts the video quality to match the user’s available bandwidth or network quality in real time – all of which ensures quick video initialization, minimal buffering, and a smooth video playback in both high or low bandwidth connections. Using ABS, users can stream both live and on-demand videos to various devices on any web server while conserving bandwidth. VIDIZMO support all types of ABS implementations in different HTTP streaming protocols, including Apple’s HTTP Live Streaming (HLS), Adobe’s HTTP Dynamic Streaming (HDS), Microsoft’s Smooth Streaming as well as MPEG-DASH, an open standard protocol for adaptive video streaming over HTTP. With ABS, VIDIZMO also ensures high-quality video delivery on mobile devices. Additionally, VIDIZMO offers dedicated mobile applications for both Androids and iOS devices to enable mobile video capture on smartphones and tablets, which further supports an organization’s bring your own device (BYOD) policies for video capture and delivery. Over the years, the growth and expansion of the video ecosystem has led to the development of various contemporary HTTP streaming protocols now used as an alternative to or in combination with legacy streaming protocols. However, despite the prevalence of HTTP streaming, progressive streaming still holds its prominence and is still widely used in various corporate scenarios. For users with a need for legacy streaming protocols, VIDIZMO provisions Adobe’s Real Time Messaging Protocol (RTMP) for Flash-based video streaming, Microsoft’s Microsoft Media Streaming (MMS) for use in various Windows Applications as well as Real Time Streaming Protocol (RTSP). Custom streaming protocols like RTMP, RTSP, and MMS enable users to maintain a persistent connection to the streaming server, with predictable latency. Additionally, custom protocols allow the user to skip and start playback from any part of the video, with minimal bandwidth waste. All this while, network congestion is minimized as all video traffic is offloaded from the primary corporate WAN to prioritize delivery of high-priority data. VIDIZMO provides users the flexibility to use any streaming protocol that best fits their needs. This way, VIDIZMO leverages advantages inherent in both legacy or contemporary streaming protocols, depending on a customer’s specific video streaming and infrastructure challenges. By default, we use progressive download, ABS and pubic CDN to optimize video delivery, but other options can be added to coexist with the default options to optimize video delivery for different locations. VIDIZMO provides a combination of solutios to suit varying customer needs and to create the most optimized solution for the customer's environment and infrastructure. The aforementioned technologies are not mutually exclusive options for implementation and we also offer software customizations to fit specific customer needs. For more on VIDIZMO's video streaming capabilities or how we can facilitate your organziation's custom video streaming needs, contact us today or visit our website for details.